Home For Waifs and Strays have launched an Artist Development Programme and they are looking for submissions. 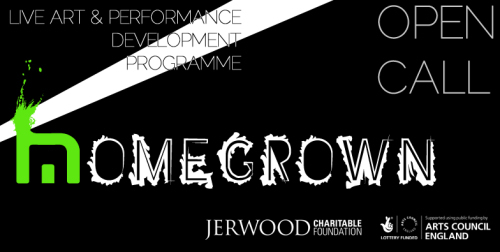 An artist development project run by Jerwood Charitable Trust and Arts Council England. The project is designed to develop and showcase some of the amazing talent that the West Midlands has to offer. Receive mentoring from some of the most innovative and exciting live artists currently working in the UK. Have access to rehearsal space in a Birmingham City Central venue. Receive support from the Directors of Home For Waifs And Strays throughout to provide professional practise guidance and advice. Attend talks on making, documenting, producing and funding from experts in these fields. Perform your work in development across four venues in the UK. Receive £100 for each performance (£400 total) plus documentation of your work. Anne Bean, Lauren Barri Holstein, Madeleine Botet De Lacaze, Ria Jade Hartley, Martin O Brien, Antonio Roberts (that’s me! ), Adam Young. In addition to this the selected artists will have opportunities to perform their work and attend talks from leading artists and producers. Full details of the programme and submission guidelines are available from the website. Deadline is 12:00 22nd April 2016.